This bread is so yummy. It has a slightly sour taste from the yogurt. Combine all the dry ingredients and mix them together well. Slowly pour in the two cups of yogurt and stir it until the dough stiffens. When you can't stir it any more it's time to knead the dough with your hands. We first worked it into a big ball inside the bowl. Dump out the ball of dough and knead it into a nice stretchy consistency. It shouldn't be too wet nor too dry. Roll out the little balls and shape them into thin flat-breads. We made ours round and of about 1/4 inch thickness. But I remember seeing them in Indian restaurants looking kind of rectangular. 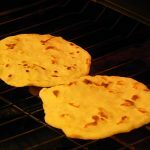 Put the flatbread one bread at a time in cast iron skillet on the stove top. Brown it on one side for a minute or two then flip it over and do the other side. Put your flatbread in the oven under the broiler. Leave there until the breads puff up then remove and put in a basket with a dishcloth in it.